Today I saw a very interesting study carried out by Which? Magazine about the performance of the 9 biggest supermarkets in the UK. The thing that caught my eye was the main headline, stating that Aldi have beaten Waitrose based on overall customer satisfaction. This may appear to be a surprising finding, and looks even more surprising when you read more of the detail. 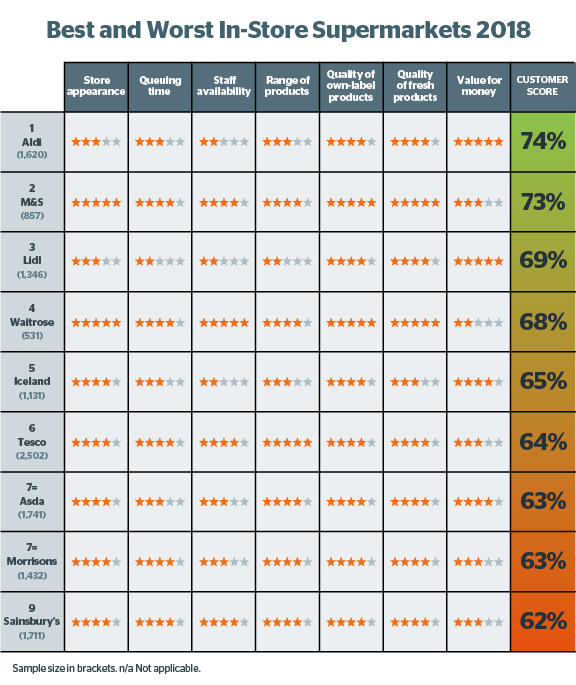 Looking at all of this, Waitrose outperforms Aldi on every measure bar one – value for money. This leads me to three conclusions. The first seems clear; value for money is exceptionally important to consumers at present, and this seems to be letting Waitrose down. Aldi and Lidl both scored 5 out of 5, and lie 1st and 3rd on the list. Waitrose has the worst score (2 out of 5) and this has moved it down into 4th place. While they may argue that they are positioned as a premium outlet, it won’t have passed them by that M&S are 2nd on the list, faring better than them on value for money. So either people believe M&S is cheaper, or they feel they’re getting a better quality product for their money. This is potentially more concerning if you’re Waitrose, suggesting an improvement in perceived quality is necessary for them to claw back some points in this area. ...the more heterogeneity in your consumer group the harder it is to satisfy them all. The third, and final, conclusion comes from looking towards the bottom, notably Sainsbury’s. My opinion on this is that there is confusion around Sainsbury’s positioning. Is it a premium supermarket, or is it more mainstream? I believe there are probably more differences in the consumers that frequent Sainsbury’s, and perhaps this makes it difficult to communicate a brand message that satisfies the whole audience. Aldi and Lidl have a discount, value for money approach that clearly resonates and appeals to their customer base. M&S and Waitrose have premium reputations, with higher quality produce and prices to reflect that. Tesco, ASDA, Morrisons and Sainsbury’s sit in that difficult middle ground with the highest volume of shoppers - but, as proven here, the more heterogeneity in your consumer group the harder it is to satisfy them all. Each supermarket faces its own challenges. And in this current shopper landscape with increased scepticism and such huge variety of choice, it's about far more than just being better than the rest. Brands need to constantly be adapting and bettering themselves to stay ahead of the game, and relevant to the consumer of today. I will certainly be keeping my eyes peeled to see how some of these supermarkets go about achieving that!